There is a lot of interest lately in eating healthy. Recently on CNN’s show Vital Signs with Dr. Sanjay Gupta, they explored several “Blue Zones” around the world. “Blue Zones are regions of the world where people live much longer than average. The term first appeared in the November 2005 National Geographic magazine cover story “The Secrets of a Long Life””, Wikipedia. Now it seems that there is a recognizable swell in the number of people moving to an at least vegetarian lifestyle. The Health Ministry of the church are quite proud to tell you that the Seventh-day Adventist Church has for over 100 years promoted a healthy, plant-based, vegan diet and that one of the few blue-zones is in Loma Linda, California that boasts a high population of church members. (https://edition.cnn.com/videos/world/2015/02/20/spc-vital-signs-art-of-aging-a.cnn). And the Hamilton Mountain Seventh-day Adventist Church promotes healthy living and a plant-based vegan lifestyle also. Because of this, I was happy to participate. 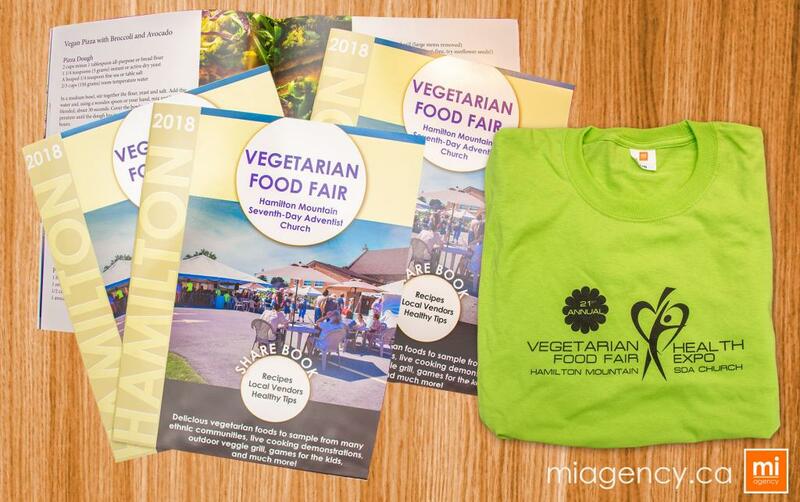 MiAgency.ca was able to design the 21st anniversary logo, create silk-screened shirts, Design their posters and design, layout and print their share-book.